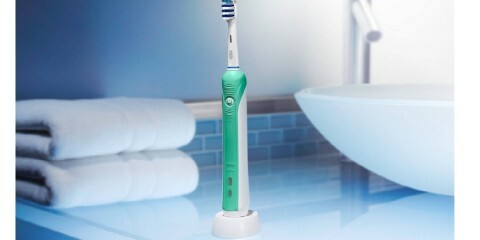 Oral-B has several electric toothbrushes in its SmartSeries line. The brushes provide you with many comfortable features that fit in well with your brushing needs, but each model is different from one another. 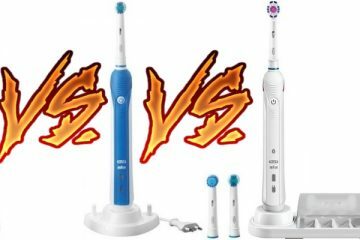 This Oral-B 7000 vs 7500 review will look at two of the most distinct models in the SmartSeries line of brushes. Each brush features many qualities that help you get the most out of your brushing needs, although you should look carefully at how these two are different from one another. They offer some high-end features, but each one has a few variations that make them different and distinct from one another. 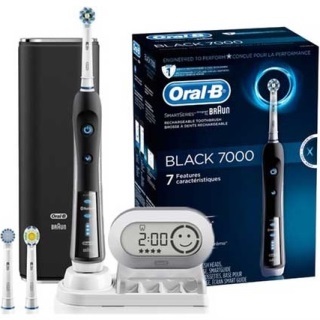 The Oral-B 7000 provides you with a striking black body, but there is more to the brush than just a beautiful style. The brush also comes with many cleaning modes for your convenience and simplicity. You can use one of six cleaning modes on this Oral-B brush. The 7000 offers separate cleaning modes for deep cleaning, gum care, and sensitive teeth care among others. There is even a tongue cleaning option for you to utilize here. Press the small button on the base to switch between cleaning options as you see fit. The 3D motion on the brush head uses a mix of rotations and pulsations to help break down plaque and clear out anything you need assistance with cleaning out. The 16-degree angles on the brush head bristles ensure you will get your teeth cleaned out quite well. The 7000 offers a pressure sensor to identify how well you are brushing. The sensor identifies the amount of force you are utilizing when brushing. The brush will stop working when you are brushing too hard. A small light will appear to let you know when you are being too rough. The charging station that the 7000 comes with features room for multiple Oral-B brush heads. You’ll also get a small timer attachment with the station. The setup times your brushing so you can ensure you spend two minutes every time you brush. A Bluetooth link is also included inside the Oral-B 7000. 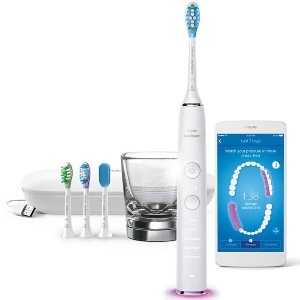 You can link the toothbrush to a mobile app on your smartphone. The app will identify information on how long you are brushing for and what you are targeting when brushing right. You can also use the Bluetooth app to identify your brushing goals so you know what you should be doing when brushing accordingly. 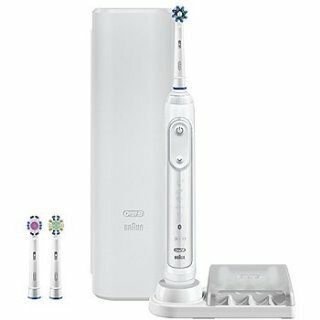 The Oral-B 7500 looks different in that the model features a white body. But there are many advanced features that deserve your attention as well. You can use one of five cleaning modes on the Oral-B 7500. These five cleaning options include choices for whitening needs, gum care, and sensitive tooth care. The display on the brush base lets you know which brushing mode you are using in real time. The SmartRing feature at the top of the brush is a popular point to note. The SmartRing helps you identify how well you are brushing. The ring flashes in various colors and will identify when you are brushing too hard. A bright red light will appear as the brush stops. Also, the SmartRing uses a two-minute timer to let you know when you need to switch to different mouth quadrants while brushing. A distinct charging case is included with the 7500. The case includes enough room for the brush. You’ll also get a smaller battery charging port inside the case. You won’t have to carry lots of stuff when traveling with the brush. Bluetooth support is also included on this brush. The 7500 links to an Oral-B phone app to identify your brushing habits. You can even customize the color of the SmartRing on the app. The battery on this brush also lasts for a while. The lithium-ion battery can last for about twelve days on one charge. This total is based on your everyday brushing habits. The added charger inside the carrying case ensures that you can keep the brush working even while on the go. The base also includes space for many other Oral-B brush heads. You can use various types of Oral-B heads on this brush with each brush head working with different intentions or specialty needs in mind. You will get a clearer idea of how well you are brushing when you use the Bluetooth app on either of these brushes. Both Oral-B models come with Bluetooth links that will help you keep tabs on your brushing habits. The app that Oral-B uses will help you analyze and keep tabs on your brushing goals. You can analyze how often you are targeting particular sections of your mouth as well. The angles used on the brush heads on both Oral-B models will help you clear out more plaque. The 16-degree angle is critical for getting deep into the teeth for removing more plaque or tartar. The end result is a fresh feeling in your mouth while also keeping bad odors in check. The movements produced by each Oral-B brush are important to your work. The movements will oscillate and pulsate along the teeth to clear out difficult stains and to neutralize even the smallest bits of plaque. The motions generated by the motors in each brush will ensure you can keep your teeth cleaner than what you might get out of a manual brush. You can get either Oral-B brush to utilize one of various brush heads. You can add everyday brushing heads to the base like the Deep Sweep option with thicker bristle surfaces or the two-part DualClean head. Some special brushing heads like the Sensitive and slimmer PowerTip brush heads can also be added. You can use any brush head by installing it to the top part of either Oral-B brush. Also, each of these brush heads is easy to clean off. The motors inside of these two brushes are sturdy and will keep moving quickly and effortlessly. More importantly, the motors will not produce lots of annoying vibrations. This ensures that you will keep a good hold on either brush while in use. You won’t have to worry about your brush wearing out from excess water. The brushes are both waterproof so you could use them in the shower if desired. However, it is best to avoid immersing either model in water for too long. 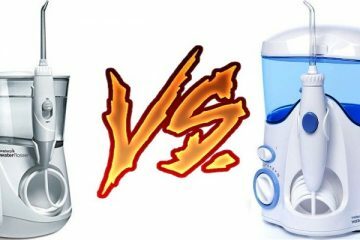 The Oral-B 7000 has one extra cleaning mode than the 7500. Specifically the 7000 uses a tongue cleaning mode. The tongue cleaning feature is designed mainly for clearing difficult bacteria off of your tongue. The two models use the same control features to switch between cleaning options though while also being easy to handle. The 7000 uses a basic pressure sensor that displays a light when you are brushing. It does not feature the SmartRing that the 7500 comes with. The 7500 uses that SmartRing for display when you are brushing too hard and for when you need to move to different parts of the mouth while brushing. The batteries on the two brushes are different from one another. The 7000 uses a nickel-cadmium battery that works for about ten days on a full charge. The 7500 offers a lithium-ion battery that lasts for a few days more. The 7500 battery also charges up faster than what the 7000 can handle. The fact that the 7500 comes with a portable charging feature in its case makes the battery all the more useful. The two brushes have near-identical bodies, but the 7500 has a slightly better grip to it. The rubberized gripping feature on the 7500 is more prominent than what you would get out of the 7000. The added rubber surface ensures you can keep a better hold on the brush at various angles, thus giving you access to more spots around your mouth. Our pick for the best Oral-B brush is the Oral-B 7000. The 7000 is cheaper and comes with many of the same features that the 7500 comes with. The added tongue cleaning mode is a big plus as well. But both of these models will help you with getting all your brushing needs handled in moments. Be sure to see how well each choice can work for you as you aim to get your teeth brushed every day. 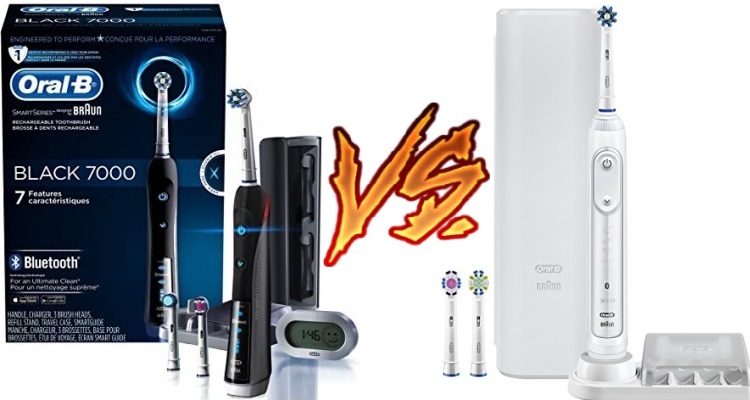 You will find that whether you choose the Oral-B Pro 7500 vs 7000, you will have a model that fits well for all your brushing demands.